An invitation arrived in my inbox a few weeks ago to attend a day at the races. A bloggers day at the races in fact, at Newcastle Racecourse with Ladbrokes. 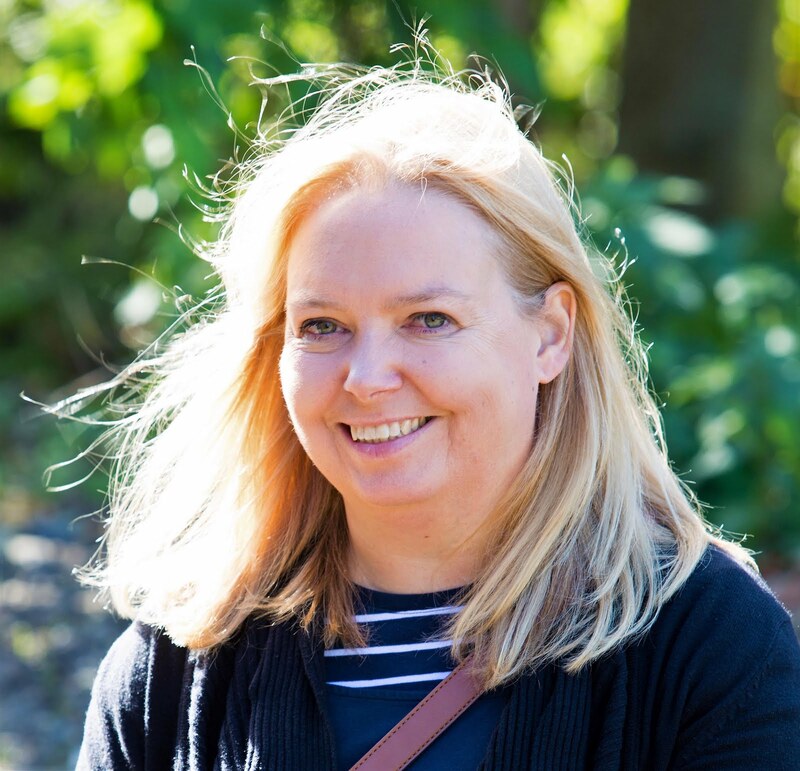 In the past, I have organised many corporate hospitality events at the races and I know it can be a good day out, so having not been for a few years, and offering the opportunity to meet up with fellow bloggers, I way happy to say yes. 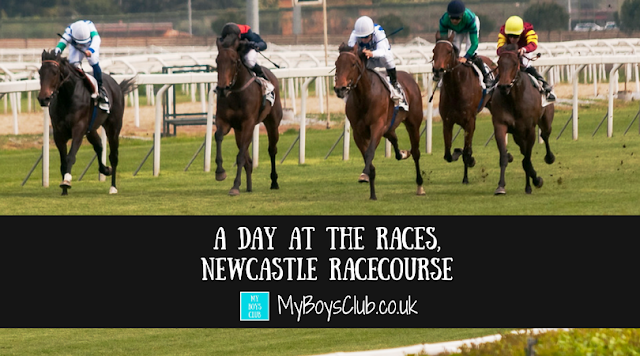 Located at High Gosforth Park, Newcastle Racecourse is steeped in heritage and history, within 812 acres of picturesque woodland. However its just a few miles outside of Newcastle city centre and also very close to the A1. The race meeting we had been invited to was the St Patrick's Day Race Day. There is free parking on site, but it was a wet day and the space I could find was quite muddy do I was glad I’d worn boots and not strappy shoes. I met a fellow blogger in the car park and we headed over to the Grade II Brandling House to collect our tickets. Up just one flight of stairs was our home for the afternoon in the Gosforth Park Suite. Here we found our hosts and fellow bloggers and on arrival, we received a glass of green fizz. The room was large, had approximately 20 large round tables hosting large groups of friends and colleagues, plus a few smaller more intimate tables for two and four people. 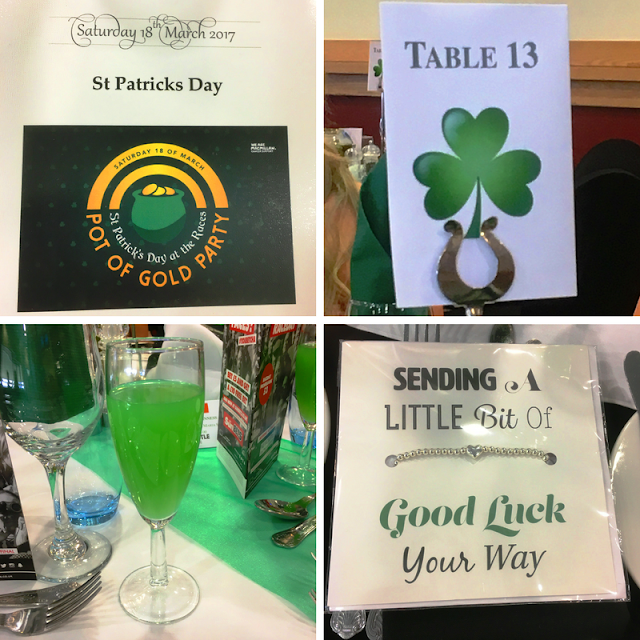 It was decorated in black and green to celebrate St Patrick's Day, shamrock table numbers, and good luck cards on our place settings. From our table from where we could see the racing on both TV screens and through the windows and the panoramic views of the racecourse that this offered. In addition, it was easy to step outside and walk down the steps to the general public areas of the Grandstand and paddock. Here you will find the bookmakers and also can see the horses after they have finished racing. A three-course meal is offered as part of the hospitality package. The starter and dessert are served to the table, while the main course is a hot buffet with plenty to choose from. Drinks are also served at the table with plenty of waiting staff on hand to take orders. Speciality themed drinks were also available. I had the trio of salmon and it was as tasty as it looks. 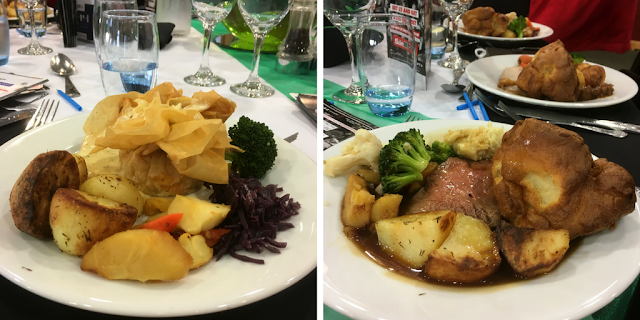 Main course: Roast beef with onions and mushrooms; Honey and Guinness roast loin of pork; Guinness marinated slow braised beef stew; plus a vegetarian option of butternut squash and roasted papers in a filo pastry. All were accompanied with your choice of roasted and new potatoes, seasonal vegetables, Yorkshire pudding and roast gravy. My vegetarian option was delicious and much better than many meals I have had at corporate functions. Desserts: Whiskey Cheesecake with fresh cream and a chocolate pencil; Glazed lemon tart with raspberry coulis and fresh berries; Sticky toffee pudding with caramelised bananas and toffee sauce; and a duo of white and dark chocolate torte with mixed berry compote. They all sounded delicious but I was very happy with my choice of the white and dark chocolate torte. This was the St Patricks Day race meeting, and not surprisingly there were many Irish punters there on the day, some dressed themed for the occasion more than others, but all looked to be having a good time. My favourite part of the afternoon was watching a man whose horse had won, gallop, yes gallop around the corporate hospitality suite when his horse became a winner and he said it was only a £1 each way bet. At the races, there is no pressure to actual gamble and place a bet, but if you do wish to, helpers are on hand to explain the different bets that can be placed. Facilities – Everything about the hospitality in the Gosforth Park Suite was very good. There was plenty of room, ample waiting staff and also lots of delicious food. And having great views of the racecourse and easy access to the public areas makes it an ideal location for a group of people to enjoy corporate entertaining, a family celebration or getting together with a group of friends. Value For Money – Our tickets were just over £100 which is pretty expensive for an afternoon out. However it is an occasion not your usual Saturday afternoon, and on par with other hospitality, and on the whole good value when you consider the whole afternoon and extras that are not part of a general admission price such as the private area and three-course meal. Dress Code – The invitation said smart and women wore dresses, and men were all in shirts but maybe not as formal or flamboyant as on other race days throughout the year such as Ladies Day and Northumberland Plate Day. But enough that you know you have been at an occasion. 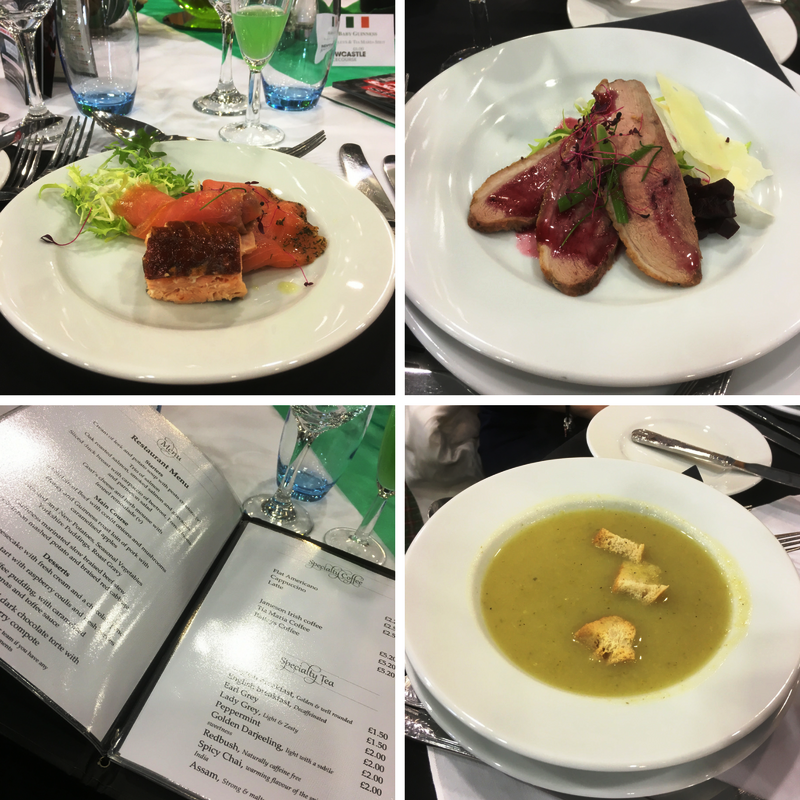 Food & Drink – The food was delicious and of a far higher quality that I have previously experienced as part of corporate hospitality days. There was a lot of choices, and on this occasion had an Irish theme, portion size was good and the presentation was beautiful. As I was driving I only indulged in a half-pint of Guinness, to celebrate the day, but was pleasantly surprised at the cost being less than I thought it would be. Overall delicious there was plenty of food and drink to accompany the thrilling racing action. Atmosphere – There was a lovely atmosphere throughout the day. The racegoers were having a good time but also respectful especially when watching the young Irish dancers. It was a very enjoyable, informal occasion and one that I’d be quite happy to repeat. Have you enjoyed a day at the races? Disclaimer: I was invited to St Patricks Raceday by Ladbrokes, and received a complimentary ticket and hospitality. All opinions are genuine and honest. Looks like a great day out! Will have to give the races a go as we have never been! !